Just like a great team, a great cocktail needs its ingredients to blend well together, to mix perfectly and become one unforgettable, wonderful experience. Create the perfect team mix while mixing perfect cocktails! Choose between making mocktails (no alcohol – best if anyone may be driving after the event) or cocktails (containing alcohol). Depending on the venue, you can either focus on drinks made with a blender or cocktails that are “shaken not stirred” (okay, you can stir them if you want to). Teams select a category (fruity, creamy, refreshing, hot, etc.) and start exploring how to make the perfect cocktail. You can pick a specific alcohol as a base as the theme for the event: gin (the joys of juniper), vodka (the great white spirit), rum (a taste of the tropics), brandy (the regal spirit), bourbon, tequila (Montezuma’s legacy), liqueurs, punches, hot drinks, or great drinks sans spirits. Meanwhile the rest of the team is hard at work on other aspects: Answering interesting questions about what kinds of liquor are in different cocktails that are named, how many ounces are in a shot, attributing famous drinking quotes by celebrities and more. The more they get correct, the more drink ingredients they can get and decorations to decorate their drinks. Other team members are dreaming up the perfect name for their inspired concoction, while others are playing Mad Men - either creating a commercial for their drink or creating a print advertisment (your choice). Appearance – Appetite appeal is the main thing. Aroma – Try to describe it to someone else. Flavor – Describe first and subsequent impressions. Refreshment Factor – Does it refresh? Is it zesty and satisfying? Does it perk you up? Aftertaste – Does it leave a different taste in your mouth? Is it pleasant or out of keeping with the flavor experience? Longevity Factor – Does it taste as good after a few more sips? After many sips? Fun awards are given for all of the other essential parts of cocktails: best drink name, best drink color, best decorated drink, best commercial or print advertisement and more! 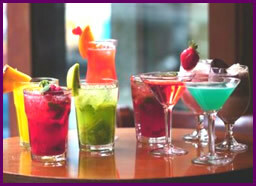 Quixote Consulting can customize the drink choices of Masters of Mixology based on your unique needs or location. For example, if your conference is in the Caribbean, enjoy fruity rum dinks. Wintertime? Try your hand at the hot toddy, hot chocolate, spiced cider, grog and other warming drinks. Teams walk away with a powerful, memorable experience of fun mixing together. They gather new knowledge about making cocktails and entertaining clients properly. After the event, they receive all of the drink recipes each team created, house specialties from the world's great bars as well as bartender's secrets for making the perfect cocktail so they can be expert mixologists - whether they're mixing cocktails or teams. Quixote Consulting's Masters of Mixology is a perfect evening team building activity, full of fun and a perfect team mixer. Savor the pleasure of having fun together and creating and mixing an unforgettable experience together! 60 to 120 minutes (average length is 90 minutes) Team Mixology is perfect either before or after dinner and is a smart and creative alternative to a cocktail hour.